The Thermo Scientific Precision 2829 Water Bath features the sturdy construction and temperature uniformity you’ve come to expect from Thermo Precision baths. The interior chamber of this laboratory water bath is 2.5L (0.70 gal.) and is built out of corrosion resistant stainless steel with a tray to facilitate heat circulation, avoiding being too close to the heating elements. The exterior of this work horse water bath is coated in a damage resistant baked on powder coat, and comes with an acrylic gabled lid that keeps condensation from falling back down onto samples and clear for easy viewing. The Thermo Scientific Precision 2829 Water Bath is microprocessor controlled and can be easily set from the upfront digital control panel. The temperature range runs from ambient to 99.9ºC with a temperature uniformity of ±0.2°C at 37°C and its temperature sensitivity is ±0.1°C at 37°C. To help prevent thermal runaway this laboratory water bath has an automatic over temperature protection and over-temperature safety circuitry. This water bath works best with distilled or water solutions, making clean up easy and extending the life of the product. 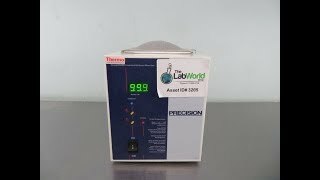 This Thermo Precision Water Bath 2829 has been thoroughly tested and is performing to expectations. All of our lab equipment comes backed with our standard warranty, should you have any questions please don't hesitate to contact us.